General Description: The Searcy type is a small to medium sized lanceolate point with a slightly concave basal edge and featuring a distinct contracting stem. The blade edges are excurvate, to straight to recurvate depending upon the extent and nature of resharpening. Many examples show delicate serrations above the hafting area. The majority of specimens are beveled. The shoulders are slight (formed by extensive grinding) to essentially nonexistent. Grinding on the stem edges and in the basal concavity is usually heavy however there are some specimens where grinding is absent. Due to their workmanship and style and the strata in which they have been carbon-dated, the Searcy type is quite definitely an Early Archaic point. Highly reworked specimens will show more pressure flaking and a steep bevel on the left side of each blade face. The cross-section is rhomboidal. The Searcy is typically found mostly in the Ozark region of southwestern Missouri, northwestern Arkansas and parts of eastern Oklahoma. The size of the Searcy point ranges from 50 mm to 84 mm in length, with the width being between 22 and 28 mm. Typical thickness is between 7 and 10 mm. Perino postulates " Searcy points resemble certain contracting stemmed points found at the Rice site in Missouri (sometimes called the Rice Contracting Stemmed type) although the Calf Creek examples are more lanceolate in shape, narrower in width and longer than those from the Rice site. The Searcy is also similar to the Rice Lanceolate which is also from the Rice site in Missouri. The Searcy type also shares some traits with the Hidden Balley I types. The latter are more strongly barbed and do not feature the beveling and serrations found on most Searcy points. All of these types seem to reflect regional variations in an early contracted stemmed tradition." 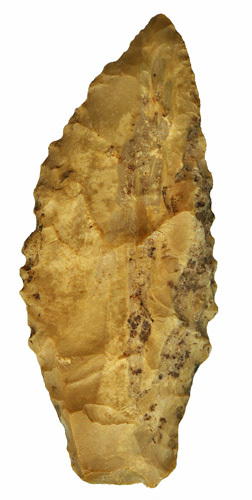 The point was named by Donald R. Dickson for examples found in situ within the Calf Creek Cave, Searcy County, Arkansas.